Carbon dioxide is a colorless, odorless, faintly acidic-tasting, and non-flammable gas at room temperature. Solid carbon dioxide, also known by the trade name Dry Ice, sublimes (converts directly from a solid to a gas) at -78 oC (-109 0F) or above. Carbon dioxide is a molecular solid with a molecular formula CO2. The linear molecule consists of a carbon atom that is doubly bonded to two oxygen atoms, O=C=O. Note: Although both are common products of combustion, DO NOT confuse non-toxic carbon dioxide with deadly poisonous carbon monoxide. Carbon dioxide is the fourth most-abundant gas in the Earth's atmosphere. Animals exhale carbon dioxide and plants use photosynthesis to convert it to sugars and other forms of energy. Commercially, carbon dioxide has thousands of uses. The most familiar example is its use to carbonate soft drinks and beer. It also finds use in a technology called supercritical fluid extraction that is used to decaffeinate coffee. Dry Ice is used in theatrical productions to make stage fogs and make "magic potions" bubble as demonstrated on the right. A common misconception is that carbon dioxide is a visible gas. The white mist that one sees around solid carbon dioxide is actually water vapor that has condensed from the air. The discharge from a carbon dioxide fire extinguisher is white partly due to condensed water vapor and partly due to solid CO2 "snow" which quickly sublimes into invisible carbon dioxide gas. This chemical behavior explains why water, which normally has a neutral pH of 7 has an acidic pH of approximately 5.5 when it has been exposed to air. It also explains the burning/stinging sensation in your nose and eyes when you inhale too quickly from a freshly-opened container of soda pop; the gas quickly reacts with the water in your eyes and nose to form a small amount of carbonic acid. Asphyxiation. Releasing any gas in a confined or unventilated area can lower the concentration of oxygen to a level that is immediately dangerous to life or health (see the first link under Further Reading below) . Be very careful entering a truck or room where solid or gaseous CO2 is stored. Likewise, some businesses and laboratories store Dry Ice in large top-loading ice chests; be very careful sticking your head down to retrieve a block from the bottom. Concentrations greater than 10% in air. Remember those chemical reactions we saw above? These are chemical equilibria, which means that the relative amounts of products and reactants depend on their concentrations. Large changes in carbon dioxide or bicarbonate concentration can lead to kidney damage, coma or even death! For a great technical discussion of the role of bicarbonate in the body see this laboratory tutorial Blood, Sweat, and Buffers: pH Regulation During Exercise at WUSTL. Frostbite. Solid carbon dioxide (Dry Ice) is always -78 oC (-109 0F) at regular atmospheric pressure regardless of the air temperature. Handling this material for more than a second or two without proper gloves can cause serious blisters or worse. Carbon dioxide gas released from a compressed gas cylinder (such as a fire extinguisher) poses a similar danger. 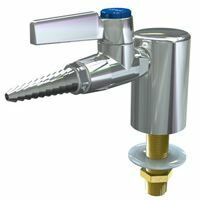 Avoid putting any bodily part directly in the path of discharge and be careful when touching any metal parts that the gas flows through. Pressure Explosion. Carbon dioxide has a vapor pressure of 830 psi at 20 °C. In other words, if one places solid carbon dioxide in a closed container at room temperature, the carbon dioxide will eventually convert to liquid and the pressure above that liquid will be 830 psi (approximately 56 times normal atmospheric pressure). The pressure will always be 830 psi as long as some liquid carbon dioxide is present in the closed container, and at higher temperatures the pressure will be even greater. While such pressures are no problem for pressure-tested gas cylinders or fire extinguishers, ordinary containers (soda bottles, paint thinner cans, Thermos containers etc.) can not handle such pressures and will explode and create shrapnel if solid carbon dioxide is sealed inside them. Putting solid carbon dioxide into any sort of closed container (glass, plastic, metal etc.) is exceedingly dangerous and is likely to result in severe personal injury or death. If, after reading the above paragraphs, you are even thinking about making a carbon dioxide bomb as a "prank", you are a complete idiot. We have personally read the full medical report of a middle school student who lost an eye in 2006 - to one of several bombs deliberately built by his teacher as a "demonstration". And in 2011, A Chicago-area teacher took out his student's eye attempting to demonstrate pressure by sealing solid carbon dioxide in a plastic bottle. Not only is the risk of injury (or even death) very high, in many states constructing, possessing or using such a device is a felony. See Salt Lake Police Department's Bomb Squad warns against homemade chemical bombs. Finally, note that carbon dioxide is a "greenhouse gas". Although it is naturally present in the atmosphere, Man's activities such as the combustion of fossil fuels have drastically increased the concentration of CO2 in the atmosphere and contributed to global warming. You are most likely to encounter carbon dioxide on an SDS in reference to fire fighting measures. 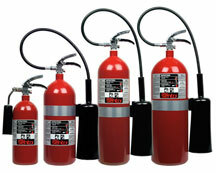 Carbon dioxide extinguishers are not appropriate for all fires, especially those involving flammable metals and pyrophoric substances. Using a CO2 extinguisher on such fires would be very much like putting gasoline on a fire! For more information about fire extinguishers and a downloadable PowerPoint presentation, visit our Fire Extinguishers page. If your company uses an automatic fire extinguishing system (such as in a computer room or where flammable organic solvents are used), critical precautions must be taken to avoid asphyxiation. Special signage and training is essential. See the DOE link under Further Reading below. You may also find carbon dioxide mentioned as a decomposition product or as an incompatible material. Supply of laboratory gases is a snap with laboratory ball valves from Safety Emporium. A carbon dioxide delivery driver died of asphyxiation when his supply hose leaked. This OSHA page includes safety info and precautions. In 2011 a woman died in a restaurant restroom which had filled with carbon dioxide gas leaking from a faulty supply line. Working Safely With Carbon Dioxide Gas at the Canadian Centre for Occupational Health and Safety. 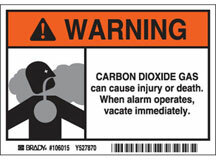 Carbon Dioxide Safetygram (137 Kb PDF file) with lots of additional info about handling and storage from Air Products. Frostbite injury of the foot from portable fire extinguisher in Dermatology Online Journal 15(9):10 includes graphic photos. OSHA's Safety and Health Bulletin on Total Flooding Carbon Dioxide (CO2) Fire Extinguishing System. Examining The Risks Of Carbon Dioxide As A Fire Suppressant at the National Institute of Standards. Wikipedia's entry on carbon dioxide. DryIceInfo.com has all kinds of information and resources about Dry Ice. See also: Asphyxiation, organic, vapor. Entry last updated: Thursday, February 15, 2018. This page is copyright 2000-2019 by ILPI. Unauthorized duplication or posting on other web sites is expressly prohibited. Send suggestions, comments, and new entry desires (include the URL if applicable) to us by email.